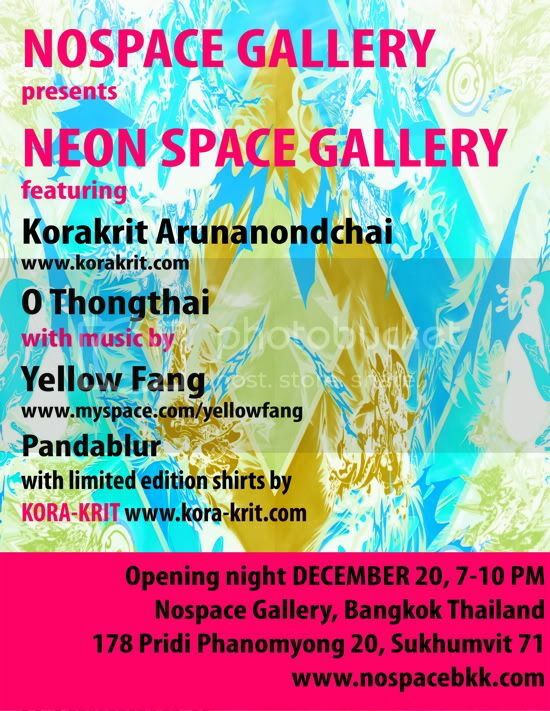 For the first time ever in Thailand Korakrit Arunanondchai and Chanyaporn Thongthai are going to have an art show. Korakrit Arunanondchai is a painter, printmaker and installation artist. His artwork deals with the idea of recreating the world with his own visual language. He makes patterns that are abstractions of traditional Thai patterns and Japanese Manga. His art is meant to create a pleasurable experience that pushes the limit of human visual perception. O Thongthai is a young artist working in London at the moment. She works in the medium of film, animation and photography. In this show she will be presenting us with a present an animation short movie based on the concept of the NEON FOREST. Neon Space Gallery is a show focusing on the bright colors that we love. The whole idea behind it is to create a fun visual space that a community can enjoy together. WEAR NEON, COME AND HAVE FUN WITH US!